I came across a quirky little post the other day on the China Car Times blog concerning Chinese wheelbarrows. Chinese one wheeled wheelbarrows are indeed different from western style barrows. 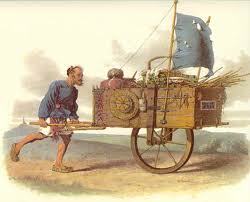 However, that reminded me of the drawings of Chinese wheelbarrows with sails and then John Milton. Milton later refers to Pequin without apparently realising that both Pequin and Cambalu are alternative names for Beijing. It seems Milton was excited by China as a vast market for English manufacturing but criticised what he saw as the country s absolutist government which, in his mind, paralleled the absolutism of Catholicism and the Divine Right of Kings.